In recent years the number of smart devices we use has increased significantly. The role of the analog / sensor IC has become critically important not only in the smart society but also in other fields. More than ever, higher performance, tighter accuracy and longer reliability are required for those devices. To address these challenges measurement systems need to have many features while maintaining a very low test cost and engineers tasked with developing test programs require very good coding skills plus in-depth operation knowledge of the test system. The new highly integrated measurement system "EVA100" is supporting Power Supplies, SMU( 4 quadrant DC Signal Measurement Units ), Pattern Generators, Arbitrary Waveform Generators, Digitizers and Oscilloscopes necessary for complete analog / mixed-signal device evaluation and measurement.This new measurement system allows engineers quickly to build their own measurement environment without combining several standalone instruments. A newly developed Software GUI is extremely intuitive, requiring only drag & drop operation, enabling engineers to create device focused measurement set ups in a very fast and simple manner. Automatic report functions dramatically improves the efficiency of deskwork, providing clear documentation and data ready for publishing in device data sheets. This new measurement system EVA100 that "Can do what you want, quickly" for the characterization, functional evaluation and mass production evaluations of low pin count analog(*1), mixed signal(*2) and Digital IC(*3) devices. All necessary functions are integrated into the compact body which has VI sources, Digital and Signal Capture. The Event Master Sequencer (EMS) controls the hardware with high timing accuracy and high precision enabling superior repeatability. Analog VI source, General Control Module and Signal Capture instruments provide versatile and comprehensive measurement capability. No programming language environment offers very intuitive operation for users, so that everyone from the beginner to expert is able to use the system quickly. Automatic report generation tools reduce the need for additional deskwork, improving the efficiency of evaluation and measurement tasks dramatically. Stackable Testing Unit architecture supports many scenarios from design to production for analog and Mixed Signal devices. Supporting external instruments, customized measurement systems can also be created according to more specific requirements and needs. Support characterization, functional evaluation and mass production evaluations efficiently. The EMS controlls the system bus and distributes the reference clocks. By adding a temperature sensor on a performance board (PB), evaluation activities under temperature test can be automated. The AVI is a Source and Measurement Unit for supplying voltage and current to the device under test (DUT). Each channel can supply up to 500mA current and up to +/-64V. Arbitrary Waveform Generator and Digitizer capabilities per pin enable the simple creation of complex measurements. MVI has the same functionalities as AVI, supplying voltage and current to the device under test (DUT). Each channel can supply up to 2A DC current and a voltage range of +/-128V, suitable for higher power output DC-DC converter ICs. 4 channels high frequency sampling digitizer to observe and measure the transient response waveform or behavior from device under test (DUT). Supports digital control with protocol based commands and the control of relays and external circuitry on the performance board (PB). The LF is an arbitrary waveform generator and waveform digitizer module covering analog measurement up to the 200kHz band width. With low distortion and low noise characteristics, it is suitable for test and evaluation of high precision devices such as audio band devices or sensor devices. The Sync Setup fully synchronizes the LF and DM (digital) modules for precise linearity test of ADC devices. The HF is an arbitrary waveform generator and waveform digitizer module covering analog measurement up to the 200MHz band width. The HF module covers a wide range of analog devices from video band to baseband band devices. The function generator and FFT analysis tools make design evaluation very efficient and productive. The SYNC controls the system bus and distributes the reference clocks, specially excellent Digital synchronization. Highly integrated measurement module such as Device Power Supply, Analog capability and Digital Pattern Generation. Matrix function allows simplified device interface design by routing the analog signal Input and Output path from Digital channel. Time Measurement Unit, VBump Function, Reference Voltage. Sequence Editor makes it easy to synchronize multiple hardware channels based on how the user determines when events occur. The Sequence Editor also supports continuous measurement or conditional loop settings enabling greater control of automated measurements. I2C, SPI, JTAG I/F are supported by protocol based control. By preparing the RegisterMap, We can use the register name for digital patterns instead of neumonics so that RegisterMap gives you the very clear overview for the digital pattern and improve readability and efficiency of digital pattern debug. The Test Conditions and Results for each measurement is reported as a HTML format which can include graphical data. Automatic report generation frees users from taking notes each time during debug sessions and exporting data, with formats such as CSV, further analysis and documentation can be performed seamlessly. How can I get a user account? What are the benefits of EVA100? Do I need to prepare any peripherals for the EVA100? I would like to try EVA100. Is there any demo system available? Is there a system for Production model? Can I use EVA100 for mass production? What's the difference between E-Model and P-Model? Is there any training class? We would like to ask for the application development, Is there any company we can ask? What is the recommended PC Specification? Can we use a desktop PC for E-Model? What kind of configuration are available? How often do I need system calibration? Can the system operate modules in synchronization? When should the AVI Stack Mode be used? What is the pulse generation width of the MVI Module? How do you use Control Bits? Can the EVA100 be used for direct control of a 12V relay? Can the LF Module be used as a single end? What are the specifications of the SB&C for the LF Module? What is the DM Module's low jitter pin 1-5-9-13-17-21-25-29 used for? Can we use some instruments with EVA100? How does EVA100 connect with external Instruments? How to get the Windows OS? Do I need to buy the software in addition? Which version of Java does the system require? What programming language is used for test program? Do project files created with different Measurement Atelier revisions work? Can I load a project file from batch files? How can I change module configurations in Atelier Editor? Can I do the Go/No-Go test? How to add my own calculation? How to save the measurement result? How can I set a loop inside a sequence? Is there a Measurement Atelier that does not require an actual system? How can I make a user function? Is there any sample code of Java? Can we call the external DLL? How do I access external files with user functions? Where are the source files for user functions? What kind of information can DM capture? Can STIL/WGL files be converted to EVA100 pattern files? What kind of file format is a waveform(AWG)? If the path name of the project file contains "#", it cannot be saved? How to install the OpenJDK? How to find the Mac Address of the computer for license request? The service option for [ATFLEX Server R1.00] is "AUTO (delay start)" by default. Is it OK to change to "AUTO"? Encountered the error message "Cannot connect to license server system, ... (Error Code:001-999-009)" during option software start up. You can register your account as follows. Click "Register" on the top of Advantest web page and go to registration page. Fill in necessary information and click "Register". Confirmation e-mail will be sent to the registered e-mail address. Click on "Confirm E-Mail". EVA100 (E-Model) is the system for engineering usage. E-Model connects to a laptop PC and customer projects like evaluation/characterization/debugging of analog, mixed signal ICs or modules are easily completed. integrates VI Source, Waveform Capture functions and Device Control function into a single compact frame. Measurements and evaluations can be made with intuitive operations without the need for programming language. The Generate Report function can dramatically increase the efficiency of tasks like data tables and figures. The expandable architecture and software environment can be applied to all kinds of processes from design and evaluation to mass production and product selection. A customized, evaluation environment can be achieved by connecting EVA100 to external measurement instruments through GPIB I/F. E-Model： customers will need to prepare PC, PCIe adapter and cables. P-Model： customers does not need to prepare any peripherals except optional parts. Yes, we can do the online demonstration and a free trial on a demo system is available. We have P-Model for Production. The P-Model docks to an automatic handling system (a handler or prober) using TTL/GP-IB for testing the devices in a factory. The P-Model is the mass production model of the EVA100 system. After evaluating devices with the E-Model, customers can immediately start production with the P-Model. Total development time (from design to production) can be shortened dramatically. Maximum Number of SBs (Shoe Box) is increased to support multiple DUTS plus SEMI Safety standard are implemented on P-Model. We have no pre-planned training course, however we can offer you training class at your request. Please contact us, we are willing to introduce you our partnership company. Here is the required PC specification for E-Model (engineering). Yes, PCIe Host adapter "OSS-PCIe-HIB25-x1-H" is required for PCI slot. There are several configurations each optimized for different applications or products. The noise level is less than 60dB. Yes, we have several accessories for high accuracy measurements and also connection kit for easy access to the evaluation board. Please contact us for more details. Single-phase AC power supply. Input range is 100V~240V, 50/60 Hz. The system supports automatic switching between 100 VAC and 220 VAC systems. Single-phase AC 200V power supply. Input range is 200V~240V, 50/60 Hz. The accuracy of internal standards is guaranteed for one year after calibration. In order to maintain the system accuracy, we recommend that the internal standards be calibrated every year. With the Hardware Sync function, customers can operate modules synchronously. Please refer to the EVA100_GUI_Reference_Manual for details. The AVI's VS (Voltage Source) mode enables voltage-added output by connecting voltages of multiple channels in series. This mode can be used when the applied voltage is not enough with single channel. For example, this mode is suitable for evaluating and producing multicell battery monitoring ICs. The pulse generation width of the MVI module is limited by current usage. For more details, refer to performance specifications. Control Bits have 64 bits and can be used to control relays etc. on a PB. For the control method, please refer to the EVA100_GUI_Reference_Manual. The PB Design Guide explains how to connect control bits. Since the resistance of the control bits is only 5V, it does not allow direct control of a 12V relay. Please use the relay drive power supply (12V / 1A) on the PB. Yes, in between Posi-PosiGnd and Nega-NegaGnd. Please refer to the PB Design Guide for recommended circuits. Please see the Standard Board and Circuit column in the Downloads section of the Advantest's website EVA100 product page. These pins have less jitter compared to other pins. Please use it according to the required performance. The instruments need to have GPIB, USB or LAN interfaces. In case of GPIB, we use NI GPIB-USB Controller to connect between control PC and external instruments. The instruments are controlled through EVA100 Software. If external instruments support USB interface, User can control it by User Function. Yes. Microsoft Windows10 Pro (64bit) is supported after Measurement Atelier R1.50. P-Model includes the EWS with preinstalled Windows OS. E-Model needs the preparation for PC which installed Windows 7(64bit) Service Pack1 or Windows 10 Pro(64bit). No. Software is included in the system. What are prerequisites for the laptop computer? Microsoft Windows7 (64bit) Service Pack 1 or Windows 10 Pro(64bit) and Java Development Kit 64bit Version 8 are required. Less than R1.20: JDK (Java Development Kit) 7. R1.20 and above: JDK 8. A programming language is not mandatory for the Test Sequence development, it can be easily built by deploying several event icons on the GUI. Project files created with the old revision Measurement Atelier can be used with the new revision Measurement Atelier, but not the other way round. Yes, with ateliercmd. For details, refer to "Loading Project File (-load)" in the GUI Reference Manual. For details, refer to "Setting the system configuration" in the GUI Reference Manual. Yes, You can set limit values for each measurement, if the measured value is out of range or not. You use the FUNC(user function) or SET VARIABLE on the sequence. Please refer to “SET VARIABLE” of the EVA100 GUI reference manual for the details of the SET VARIABLE event. Please refer to “EVA100 user function design guide” for user function. Judged values are displayed in the console window and you can save them as a test file. In addition, measurement results and details of test sequence (conditions, sequence) and system information can be stored as a report file. Please refer to "Setting the loop" in the GUI Reference Manual. The "EVA 100 Atelier Editor" can be used without actual equipment. Please purchase separately. Please refer to "Creating User Function" in the EVA100 User Function Design Guide. Yes. Refer to "Calling DLL" in the EVA 100 User Function Design Guide. Please refer to "File output" in the EVA 100 User Function Design Guide. For those functions that are published, they can be downloaded from the Advantest website. It can capture pass / fail, fail count, etc. for each cycle. For details, refer to Output file format (4), (5), (6) in the GUI Reference Manual. Yes, the optional software 「STIL Reader Plus for EVA100」 support the conversion. Please refer to the "Waveform definition file" in the GUI Reference Manual. Correct. Please use path names that do not contain "#". Please refer to the "Software installation manual". Open the command prompt window then type the following command. You can use the mac address at the first line. The service option for [ATFLEX Server R1.00] is "AUTO(delay start)" by default. Is it OK to change to "AUTO"? Normally there is no issue, however rarely under the high loading status the server PC the license server program may fail to initially start. In this case please start it manually. Please refer to the "ATLEX Package Installation manual" for how to start. No access to the license server machine or license server service is not running. Confirm the ATFLEX license server service status. Reached the maximum license count or license has been expired. Not registered the license file. Register the license file you purchased. Please refer to the "ATLEX Package Installation manual"
* IEEE, IEEE Std 1450, IEEE Std 1450.1 are registered trademarks of The Institute of Electrical and Electronics Engineers, Inc.
* CATVert is a trademark or a registered trademark of Advantest Corporation. Firmware update program is bundled in install program of Measurement Atelier. Read carefully the information below before you update the Measurement Atelier and Firmware. You must make sure that the status of EVA100 Measurement System is PASS by performing Selfcheck/Diag tool. You might need to update the firmware of EVA100 System after updating the Measurement Atelier. Please refer to the EVA100 Installation manual for the Measurement Atelier. In case there is a revision mismatch between Measurement Atelier and Firmware program, the warning message will be shown during starting up the Measurement Atelier, then corresponding firmware must be applied. Please refer to the EVA100 firmware update manual in the install folder of Measurement Atelier. The following precautions are to ensure that the firmware update program works correctly. Please be aware that you may be charged technical service support in case of faults arising due to not adhering to the precautions. Confirm that you are logged in as an administrator. Confirm that no programs are running, including Measurement Atelier. Disable the setting to restart after installing the update program in the Windows Update settings on the Control Panel. If you are using a laptop PC, connect the main AC power supply adapter. Confirm that the PC will not go to sleep mode automatically during firmware update. Do not touch the PC power button. Do not set the PC to sleep mode. If you are using a laptop PC, do not close the cover. Do not disconnect the cables between the PC and the EVA100 Measurement System. Do not turn off the power supply of EVA100 Measurement System. Do not abort the firmware update program via the Task Manager while it is running. The firmware update program might need to perform several times. If the update program got a failure, must retry without stopping the system until the update program got a success. Caution) If the update program does not finish within the time noted in the manual and no progress is made at all, Press the [ctrl]+ [c] key on the command prompt window to force abort the update program. Please retry the update program. Caution) If the message "Firmware Update -> PASS !!" is not displayed even after executing FirmwareUpdate.exe several times, There is probably a problem with the EVA100 Measurement System. Turn off the power of EVA100 Measurement System and contact our customer service center. After the Firmware Update program succeeds, please make sure that the status of EVA100 Measurement System is PASS by performing Selfcheck/Diag tool. Support 1.6sec for maximum sampling time. Fixed the ground Level when changed the load condition from PL to Term. Upgrade TMU Function of DM and GCM. Support continuous signal measurement mode. R1.01.00 (13.1MB) This is a Windows application that performs periodic calibration of the testing unit. Performs reference calibration of SYNC and EMS, and level calibration of SCAP module. To run this application, you need to install OpenJDK. R1.00.00 (8.2MB) This windows application reads and writes the board information of the SYNC and EMS module. When these modules need to be replaced due to a failure or other reasons, it is necessary to copy the recognition information of the module from the one before exchange to the one after exchange. To use this application, you need to take our maintenance training. LPF User Function Library 9-Bands precision Low Pass Filter for LF (AWG) module. BEF User Function Library 9-Bands precision Band Elimination Filter for LF (DGT) module. CAN/CANFD User Function Library This product is the interface board for CAN protocol. LIN User Function Library This product is the interface board for LIN protocol. CAN User Function Library This product is the interface board for CAN protocol. Sequence Gadget is a standard template for test sequence that is supported by EVA100. The program development will be easier by registering into a gadget from test sequences. This is a Sequence Gadget for DC testing of ADCs by DM64. This is a Sequence Gadget for DC testing of DACs by DM64. This is a Sequence Gadget to test digital devices for contact, parametric and other tests. SeqGadget_Digital_Continuity_DPS_OpenShort Sequence for testing contact of power supply pins. SeqGadget_Digital_Continuity_IO_OpenShort Sequence for testing contact of signal pins. Use a DM64 PMU. SeqGadget_Digital_Continuity_IO_FT Sequence for testing contact of signal pins using a functional test. SeqGadget_Digital_Continuity_VPP_OpenShort Sequence for contact testing of VPP pins. SeqGadget_Digital_Functional_Test Sequence for testing functions. SeqGadget_Digital_PowerSupply_IDD Sequence for parametric testing of power supply pins. Measures IDD (power supply current) using the V Source & I Measure function of DPS resources. SeqGadget_Digital_IDDQ_PatternTrigger Power supply current is measured by synchronizing with the pattern. SeqGadget_Digital_IDDQ_EventBase Power supply current is measured by synchronizing with the WAIT instruction. SeqGadget_Digital_PowerSupply_Vbump Sequence for parametric testing of power supply pins. Source voltage is switched by functional test. SeqGadget_Digital_IOParametric_VIH Tests Pass/Fail change points as VIH is altered using binary searching. SeqGadget_Digital_IOParametric_VOH Sequence for measuring the device output voltage. SeqGadget_Digital_IOParametric_IIH Sequence for parametric testing of signal pins. Measures IIH (high level input current) using DM64 module PMU interfaces. SeqGadget_Digital_IOParametric_IOH Sequence for measuring the device output current. SeqGadget_Digital_TimingSearch Sequence for obtaining the strobe position (comparative judgment timing: STBL and STBT) representing the boundary between pass and fail, using the sequential search method. SeqGadget_Digital_Frequency_Measurement Sequence for measuring frequency. SeqGadget_Digital_Two_Dimensional_Shmoo Sequence for acquiring 2D shmoo. SeqGadget_Digital_Margin Sequence for margin testing. SeqGadget_Digital_Trimming_GetTrimValueFromTrimTable This is a search sequence that converges on a target value by changing an input parameter. SeqGadget_Digital_Trimming_GetTrimValueFromMeasVal Sequence for obtaining the correction value (trimming value) from the difference between measured device characteristic values and prescribed values. SeqGadget_Digital_Trimming_Veirfy This is a sequence that confirms the target trim value was achieved. SeqGadget_Digital_TDR Sequence for TDR (Time Domain Reflectometry) measurement. This is a Sequence Gadget to test operational amplifier for gain, phase and other tests. This is a Sequence Gadget for the A/D Converters linearity test by using sine wave histogram method. This is a Sequence Gadget to test operational amplifier for THD+N, THD and SNR tests. Display the configurations and detailed pin map on a pogo connector. Easy to find a pin location on the performance board. Display a waveform data or csv file graphically. Support versatile waveform data file creation for AWG graphically. Display digital pattern failures graphically. Display digital pattern file syntax with instructions. Support DSRC pattern file creation for DAC graphically. 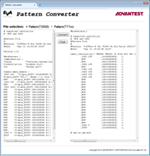 Convert the Pattern file(T77xx, T2000) to EVA100. Convert SPI/I2C commands to Digital pattern format. You need a license password to use the following software products. Please login to our web site (above link) with your account. Open the "License" page, then specify the required information in a form. The license password will be issued and send to registered E-Mail address. Please refer to installation manual of software product.